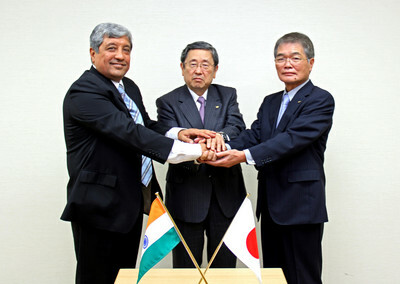 (KARIYA, Japan) October 24, 2013 – Toyota Boshoku Corporation (TOKYO: 3116), a premier manufacturer of automotive interior systems, is pleased to announce that it has reached an agreement to establish a joint sales venture with Relan Group of Industries, an automotive components supplier that makes seats and other components in India. With the aim to strengthen its sales structure and expand business in the decisive Indian market, the Toyota Boshoku group has established a joint sales venture, TOYOTA BOSHOKU RELAN INDIA PRIVATE LIMITED. In 2012, Toyota Boshoku and Relan Group agreed to combine their collective strengths to expand their seat and interior component business in India by tapping Toyota Boshoku’s global R&D power and high quality manufacturing with Relan Group’s sales and purchasing strengths. Toyota Boshoku’s technical operations will support sales activities to realize swift and accurate assessment of customers and their needs in the Indian market. Toyota Boshoku’s management hub for the Asia & Oceania region, Toyota Boshoku Asia Co., Ltd., and Relan Group’s automotive components company, Sharda Motor Industries Limited will invest equally in the joint venture. Toyota Boshoku has been doing business in India since it set up its subsidiary Toyota Boshoku Automotive India Private Limited in 1998. The company’s 800 employees produce seats, door trim, air cleaners and other automotive components. Toyota Boshoku will continue to strengthen its business in each region and offer customers worldwide appealing, comfortable and safe automobile interior space. Toyota Boshoku Relan India Private Limited is slated to be established in Pune City, Maharashtra State of the Republic of India in November 2013. The Chairman of the new company shall be Mr. N. D. Relan, representing the Relan Group, and heading up the company as Managing Director will be Mr. Toshifumi Chujo, representing Toyota Boshoku Asia. The company has been set up with a capital of 80 million Indian Rupee (approx. 1.4 million US$) and is equally held by Toyota Boshoku Asia and Sharda Motor Industries Limited. The company will head up sales activities for automotive seats and interior components in India. Toyota Boshoku group, one of the world’s premier interior system suppliers and filter manufacturers, develops and produces interior components, filtration and powertrain components at over 100 sites in 27 countries around the world. During the fiscal period ending in March 2013, Toyota Boshoku had consolidated net sales of 1,079 billion yen (approx. 13 billion US$) and operating income of 25 billion yen (approx. 30 million US$). Toyota Boshoku’s management hub for the Asia & Oceania region, Toyota Boshoku Asia Co., Ltd. was established in Thailand in June 2001 and is a leading manufacturer of automotive seating and interior components with 23 sites throughout the Asian region including Thailand, India, Indonesia, the Philippines, Vietnam and other countries. The Relan Group has been engaged, inter alia, in the business of manufacturing automotive components since 1983 and has expertise in doing business in India. The Relan Group has a sound engineering base and capability in producing high quality, cost competitive products and has built up a substantial customer base in India over the years. Founded in 1930, it has approximately 2,500 employees (consolidated) and consolidated net sales of 250 million US$.